This page describes the fifth step of creating a backup task with the New Task Wizard. "Many-to-one". If you want to create a SingleZIP archive for the entire backup set, select the first option. By default, this option creates a temporary directory, providing more convenient compression. You can also force the program to make no temp folder by clearing a checkbox. Then, files are packed to the single ZIP directly, saving both the job time and resources of the operating hard drive. "One-to-one". Select the second option (MultiZIP archive) if you want to create a separate ZIP archive for each file backed up. 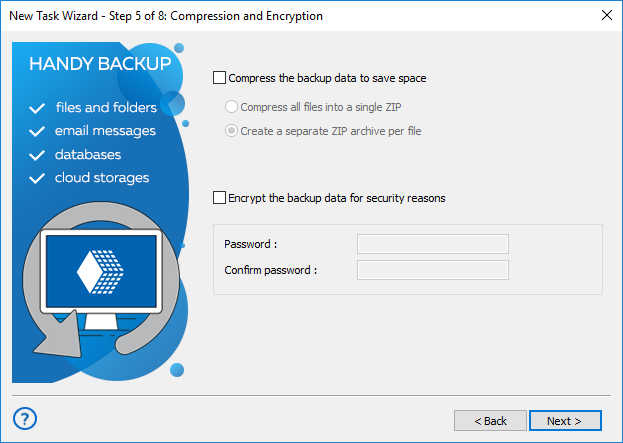 To enable encryption, check Encrypt backup data with a modified BlowFish algorithm for security reasons and specify password in the respective fields. Note: Encryption of your backup do not depend on compression options selected earlier.